I just tried a round of CA on the Rotterdam -Market. There was an enemy that sits in an armored vehicle and does not get out. So unless you are Assault class with explosives, you can not kill him and complete the level. I could not find any explosives either. Lol, the point is it's multiple players, if none of you has explosives tough? Support can kill stationary vehicles by dropping anti tank mines and shooting them. Combine arms is pretty lame but this isn't a real problem. They quite clearly state play it solo or co-op on the menu screen. So OPs statement stands. If you play solo, and don't have explosives, you're screwed. Is there a 3rd Rotterdam map in Combine Arm? Because im pretty sure that there's Dynamite/Panzerfaust supply spot in both maps. I did it as recon, alone. There is sticky dynamite in a crate in front of the white house. Yup. Just did it as a medic (mostly with a looted STG44 but hey-ho lol) and you're 100% correct. 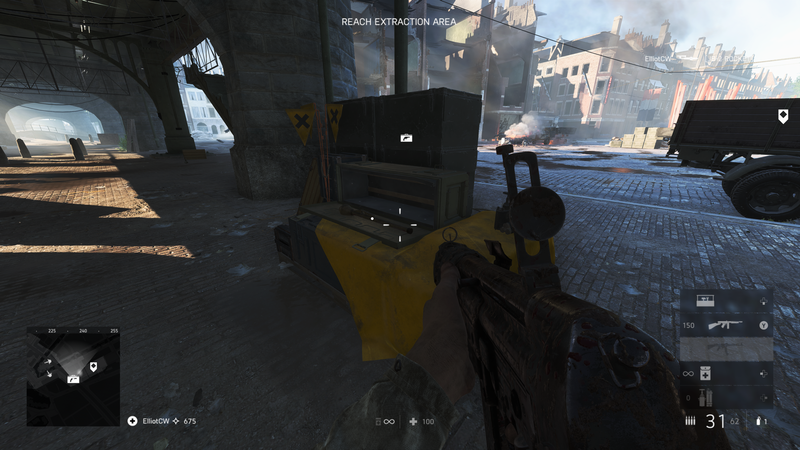 There's also a panzerfaust which appears a little further up once you blow up the transport to help with the tanks during extraction (you probably already know and I'm just mentioning it for OP). Not sure about the Rotterdam map but the mortar tank thing on arras can be destroyed by sneaking up next to it, getting the enemy's attention and then it mortars itself, give it a go it's hysterical. Maybe the same on rotterdam? an interesting thing in the Co-op is if the NPC vehicles catch fire they start taking damage until they explode. Ah ok, yeah not played that one yet.